I’ve had this book under my coffee table for a while now and have flicked through it quite a few times after the initial cover to cover read through, so it’s about time I did a proper review of it. The first read through left me a little bit disappointed that I got through it so quickly, there’s not a huge amount of text in the book and for someone who has only spent a couple of weeks in California and only seen the strip of coast between San Diego and LA, I was hoping for some more in depth info on each area visited. Fortunately, each time I return to it now I find it more and more interesting, I dip in and out to enjoy the photo’s rather than try to follow the story, although it is laid out in a chronological and geographical order, it’s more fun for me to skip around and see the variety of set-ups and waves along the coast. What I appreciate a lot more now is the attention to detail, there’s no weird aspect ratio’s like in Jim Russi’s Flying Through the Clouds to distract you, and the captions are all hand written, not rendered in a font that looks like hand writing, actually written by hand and digitised, the fonts that are used are well chosen and the design and layout works really well. As you would imagine there are plenty of lifestyle shots but they’re definitely not filler, there are no snap shots in the whole book, it’s all good photography, even if it just documenting a parking space or waiting at a bus stop. The presentation is also great, you get a nice dust cover and the book feels solid, it’s inspired me to try and make a coffee table book featuring the less well known breaks I frequent, I doubt it will feel quite as nice though. I was reminded of this book when I got my hands on a copy of Russia, Chris Burkards latest DVD/Booklet project, I haven’t had a look through it yet but I’ll probably check it out soon and try and get a review up if possible too. 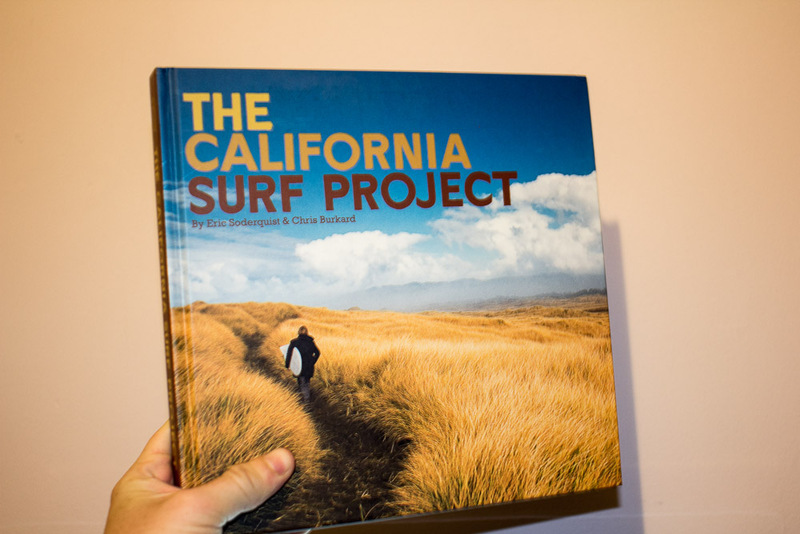 If you’re interested in California and/or surf photography, it should be on your wish list, and it will appeal to non surfers too, I’m glad I came back to it after the first zip through.